Khalid Nassour is in way over his shiny helmeted head in DC’s Dr. Fate ongoing series, which follows the Egyptian-American med student as he unwillingly becomes the central hero in a battle between ancient Egyptian gods for the fate of the world. Writer Paul Levitz and artist Sonny Liew share a “storyteller” credit on this title, and that tight collaboration is the reason Dr. Fate has become one of the sleeper successes of the DCYOU campaign. Levitz’s DC output of the last few years hasn’t been particularly inspired, but creating a new legacy character with an exceptional artistic collaborator has brought imagination and depth to Levitz’s work on the series. Taking a cue from Ms. Marvel, Levitz uses Khalid’s superhero experience to explore his relationship with religious faith, and getting caught in a war of ancient deities has forced Khalid to reconsider how he looks at his father’s Muslim heritage and his mother’s Christianity. All it takes is one look at the cover of this week’s Dr. Fate #5 to see what Liew brings to the title, from his impeccably clear composition to his bold character designs. His cover takes a very unconventional approach, but it shows how a different perspective can have a huge impact when executed with precision. Liew has an expressive, idiosyncratic style that makes Khalid’s story fresh and exciting, and Lee Loughridge’s colors highlight the narrative’s contrast of reality and fantasy by incorporating bright rainbow beams and streams of gold into a textured, grounded palette. The book’s striking visuals are a prime example of how DC has brought more stylistic diversity to its line with DCYOU, and the strength of Dr. 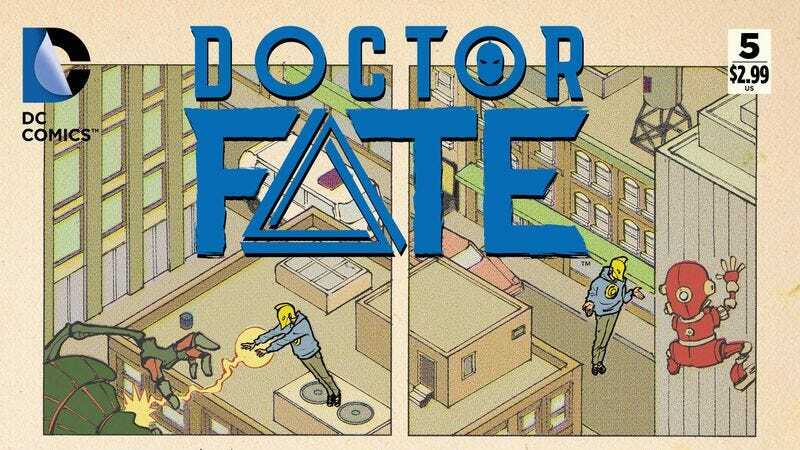 Fate is a direct result of DC striving for better creator representation by hiring Liew, a Malaysian artist with strong roots in independent comics. Dr. Fate is a step toward the ideal future for DC Comics, one where it isn’t afraid of trying something new both on and off the page. Hopefully more readers will find their way to the book before its middling sales lead to cancellation.